Rather than hiding ugly cracks and hazing in a concrete floor, this creative contractor accentuated their beauty Project submitted by Amedeo Cilli, Concrete Concepts Inc., Hackensack, N.J. 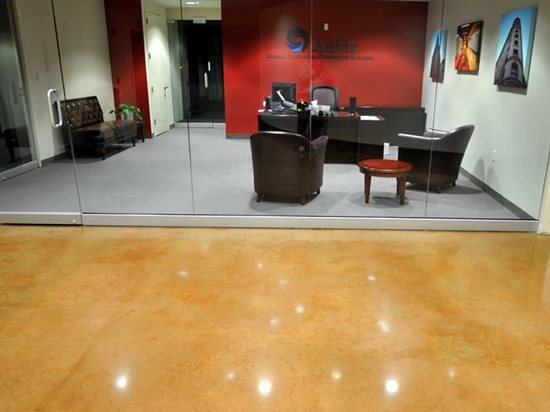 Previously covered by carpet, the polished and dyed concrete floor in the office of Anlar General Contractors is now a low-maintenance, light-reflective surface. A densifier and finish coat were applied to enhance the floor's durability and gloss. Most contractors would cringe when faced with rejuvenating an existing concrete floor riddled with cracks, pits and hazing. Not Amedeo Cilli of Concrete Concepts of New Jersey. In fact, on a recent project he used those flaws to his advantage, darkening them with dye to add a gorgeous crackle effect to a polished floor. The 2,000-square-foot floor is now the gleaming focal point of the corporate office of Anlar General Contractors, Rahway, N.J. "It was originally covered with carpet, but the owners had seen polished concrete at another project and liked the idea of low maintenance," says Cilli. After Cilli and his crew removed the carpet, he discovered minor cracks and pits from previously installed partition walls as well as extensive hazing. However, none of the flaws were structural in nature, and otherwise the floor was in good condition. A close-up of the floor shows the distinctive decorative effects achieved by air-brushing the cracks with dye, creating a beautiful crackle pattern. To prep the surface, he used citrus-based strippers to remove the glue and then filled the cracks with a white-tinted filler from Ardex, smoothing it to a feather edge. 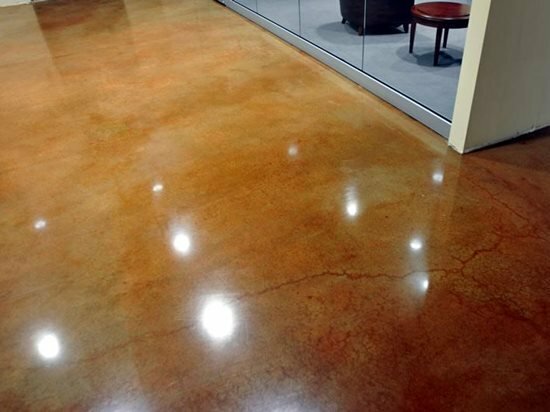 Next, his team dry polished the floor to 3000 grit using a 30-hp floor grinder (the Prep/Master 3030). "The entire project was dry polish, because we were working above the city library and were very concerned about any water making it downstairs," says Cilli. "I even told the men they could not sweat!" To give the surface an extremely durable, low-maintenance, glossy finish, Cilli applied Scofield's Formula One lithium densifier. He then colored the floor with Scofield's Formula One liquid dye concentrate in Driftwood, enhancing the cracks by applying additional applications of dye with an air brush. The acetone-based Formula One is a penetrating, translucent dye specifically designed for application to ground and polished concrete. "We took great care to accentuate the beauty of the hazing and cracks," says Cilli. "Because we had filled the cracks with a white-tinted filler, they took the color even more and became more visible." Cilli says that the demand for decorative concrete polishing is growing rapidly in his area, so tapping into this market was a natural evolution for his business. "As an architectural concrete contractor, it was a perfect fit for us. We have an enormous advantage over most of our competition in that we do not just polish, we will take on the entire scope of the project, from pouring to decorative cutting and ultimately polishing. Most clients like this approach since there can be no finger pointing."